Gold is the world’s most polarising asset. People either love it or hate it. You’ll be denigrated a gold bug for owning it, or an ignorant moron for not. There are good reasons for this division. Gold’s position is an odd one thanks to its characteristics, history and the way it’s traded today. Nobody can agree on any of those three, so they can’t agree about gold either. Some people will tell you gold is the only true form of money, while others will decry its uselessness because you can’t spend it. Some will tell you about how gold was money for thousands of years, while others will point out that we finally managed to get rid of it last century. The same facts lead people to opposite conclusions. The same people who were once staunch advocates of gold can go to being its harshest critics and then return to favour it over the course of their career. The best example of this is former Federal Reserve Chair Alan Greenspan. In the midst of all this, it’s tough to untangle any truths or reach any certain conclusions about gold. After all, when it comes to financial markets, the truth is what enough people perceive it to be. Gold is somewhat of an odd asset thanks to its history. For much of the history of money, gold was the determining factor in the value of currencies. Each different currency represented a redeemable amount of gold (or silver). This meant there wasn’t really a price of gold as such. Gold was the constant in a world of changing currencies. But that ended when America abandoned the gold standard in the 70s and the US dollar became the world’s reserve currency without any precious metal backing. The chart below shows the history of the gold price since 1973. These days, the gold price is primarily set in financial markets, just like for other metals. In fact, about 15,000 times more gold is traded in financial markets than there is actual physical gold in the trading process. And almost all contracts settle in cash, not gold. So you can see how the gold price is completely financialised. 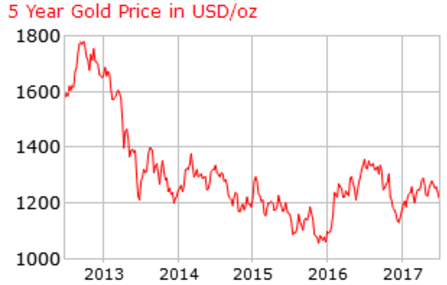 The supply and demand for physical gold seem to matter very little in setting the price. Many argue this means the gold price is manipulated. The financial market price is set between the London Bullion Market Association’s trading and the COMEX contracts in Chicago. The LBMA is steeped in history and still has some esoteric rules. London Metals Exchange gold traders operating in the trading ring must keep one heal touching their seat at all times, for example. The COMEX is the biggest derivatives market in the world. The power of Asian gold exchanges has been growing, but they’re far from matching the UK and US hold on gold. A few thousand years ago, an ounce of gold would’ve bought you a toga and sandals in Rome. Today, an ounce of gold is worth about the price of an Italian suit and shoes. That is the immense power of gold. It’s why wealthy families own the stuff – wealth preservation. There is no asset that does it better. A 150% gain while stocks crashed? Even a small allocation to gold would’ve offset the disastrous returns elsewhere. Not to mention the peace of mind while banks went broke. The thing is, wealth preservation only matters at certain times in history. Times of turmoil, war, currency debasement and financial panics. But these are too difficult to predict accurately, so it’s always a good idea to own some gold. Many advocates choose 10% of your investable wealth as the rule of thumb. A separate question to preserving wealth is whether you should own gold as a performing investment as well. Do you expect the price of gold to outpace other investments? First, don’t forget to keep this investing separate to the ideas of wealth preservation. I think owning some gold is pretty much required if you want your wealth to be robust. Whereas investing in gold for gains is only a good idea sometimes. The confusing part is, you want to own gold as an investment when the likelihood of turmoil is rising – just when wealth preservation becomes important. But nonetheless, keep your investment gold separate from your wealth preservation gold, at least in your mind. So, how has gold performed as an investment? Well, looking back thousands of years certainly doesn’t prove anything relevant if it’s returns you’re looking for. So the question is, how far back should we go? Regardless how you answer that question, your conclusion will be pretty much the same. As I mentioned, gold outperforms during crises. The rest of the time, it languishes. Gold rallied from £700 to over £1000 in anticipation of the Brexit vote, which sent shockwaves through the stock market. It doubled during the financial crisis while stocks crashed. The rest of the time, gold usually doesn’t quite manage to keep up with the stock market. 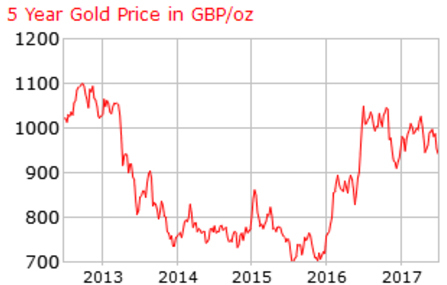 This 5 year chart shows a wedge formation in the gold price since the Brexit referendum. Any breakout from this wedge suggests a sharp upward or downward movement is in the cards. But if you would like to speculate on the gold price, there may be a better way to do so than owning the metal itself. 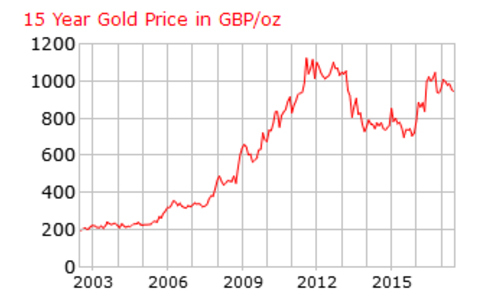 To check the price of gold per gram in the UK, click here. Gold is often compared to a variety of assets. This can reveal its strengths and weaknesses. The closest competitor is silver. This cheaper cousin of gold has much the same monetary history. In fact, there’s a good reason our British currency is called the pound sterling. It used to be a pound of sterling silver. But it’s the differences that make gold and silver interesting. Silver has far more industrial uses than gold. So it can surge during good economic times too. Gold is mostly just a precious metal, not an industrial one. Although jewellery demand is significant. As for the prices, one way you can look at the relationship between gold and silver is the gold to silver ratio. The number tells you how many ounces of silver it takes to buy an ounce of gold. This chart shows 100 years worth of data. When the blue line is at highs, silver is cheap and gold is expensive relative to each other. Right now, buying silver looks like a good bet. But the silver price per gram can move quiet fast To check the silver price in the UK, click here. Another way to invest in gold is to buy shares in gold companies. This introduces new risks and opportunities. Although the gold price is still an important factor, the risks and rewards of owing a stake in a mining company are greater. In some cases, far greater. More on gold stocks below. Lately, thanks to the bitcoin boom, you often hear people comparing cryptocurrencies to gold. Indeed, about a dozen cryptocurrencies are gold backed. The similarities and differences are intriguing. Both gold and cryptocurrencies are non-financial assets, meaning they trade outside the financial system. As you discovered above, this is only true to a limited extent. But for both assets, it is possible to escape the financial world entirely while holding your wealth in them. The gold price and bitcoin price both seem to respond to geopolitical turmoil. People buy both assets when their government is cracking down or breaking up. This makes them a good way to trade that sort of instability. The key differences are that bitcoin is digital, relies on infrastructure and is far more volatile. Gold is tangible, historically proven and more stable. That’s not to say gold is superior. It’s just that the assets are and therefore behave differently in different circumstances. Consider what you’re trying to achieve before deciding which one to buy. There’s a particular reason to own gold which most investors don’t know about. That’s because the majority of investment advice in favour of gold comes out of the US. Ironically enough, American investors benefit least of all from owning gold. The Brits are somewhere in between, while the Australians and Canadians see their gold returns skyrocket during a crisis. Gold, like oil, is priced in US dollars. That price is then converted to your local currency to get the local gold price. Even if the gold price is steady, changing exchange rates mean changing local gold prices around the world. This creates an added complication for gold investors outside the US. How will their currency perform in different scenarios? Will it offset their gains or losses in gold, or will it add to them? After all, similar variables affect both the gold and currency markets. 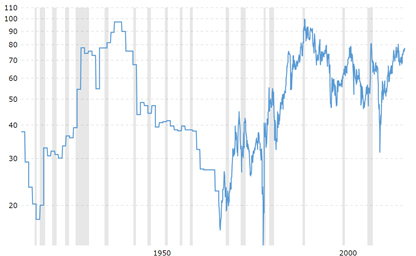 Money printing, crises and plain old GDP growth, for example. The gold quadrants are the four possible outcomes when you invest in gold as a British investor. The gold price in US dollars can go up or down. And the exchange rate, which gives you the pound gold price, can go up or down too. Two variables give you four possible outcomes. Say the gold price in US dollars goes up 5% and the pound goes up 5% too. 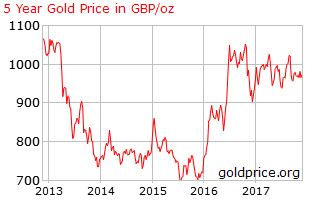 That leaves the UK gold price with no change. That’s because the gains in gold are cancelled out by the lower amount of pounds you get for your US dollars. This is only one of four possibilities. I’ve put all four possibilities in a table — the gold quadrants Table. It shows all four possible outcome for British investors. What I call “the four quadrants”. The thing to understand is that these four quadrants are not equally likely to occur. Each one has a particular set of scenarios which will bring it about. Different combinations of money printing, GDP growth, inflation and everything else that can affect both the exchange rate and the gold price. For example, during a financial crisis, the US dollar surges against just about all currencies. That means a weaker pound against the dollar. Gold is a safe haven, or safe investment. It spikes when risks in the economy rise like in 2008. This combination makes gold a brilliant investment for Brits because the currency move supercharges the gains from gold during a crisis – just when you want gold to perform. As Quadrant 2 explains above, you profit from the gold price and the exchange rate. Compare this to what happens to an American gold investor in a crisis. Their dollar currency is a safe haven. 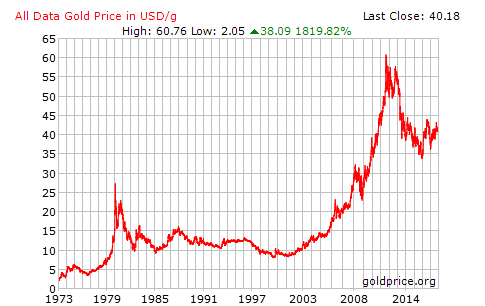 The US dollar surges alongside the gold price during a crisis. This decreases the benefit of owning gold, as it cancels out some of the gains. Usually, gold surges faster than the US dollar, making gold a good crisis hedge for Americans too. But far less beneficial than for Brits. Does it really work like this? This is an example of currency moves holding your gold steady in pounds – Quadrant 4. It’s not a bad result. But the real focus remains the supercharged gains during a crisis. The James Bond movie Goldfinger is a little mystifying to the younger generations. Gold has little connection to the global economy or financial stability these days. Back when Goldfinger hit the screens, it was vital. Still, every now and then gold makes a comeback into geopolitical headlines. Take for example the drama about German gold repatriation. The German Court of Auditors responded to a growing conspiracy movement in 2012 by demanding the Bundesbank do an audit of its gold. The existence and weight had never been confirmed. But not anymore, say the Germans. They want their gold back now that the Russians aren’t breathing down their necks… to the same extent as after World War 2. But why? And why can’t the gold just be audited at the Fed and in the other locations around the world where Germany keeps its gold? Having completed its repatriation of $28 billion in gold three years early, the Bundesbank in Frankfurt thought it was sitting pretty. Until someone found a World War 2 British “blockbuster” bomb down the road. After all this drama, only about half of Germany’s gold is actually on domestic soil. Germany’s repatriation was far from the only time gold made headlines in recent years. All sorts of conspiracies about gold continue to roll on. Some have been vindicated. Lately, the focus has been on China and Russia’s accumulation of gold, adding to their reserves. China only occasionally updates its estimates. And many speculate the true holdings are vastly higher. Russia has the highest ratio of gold relative to its economy. 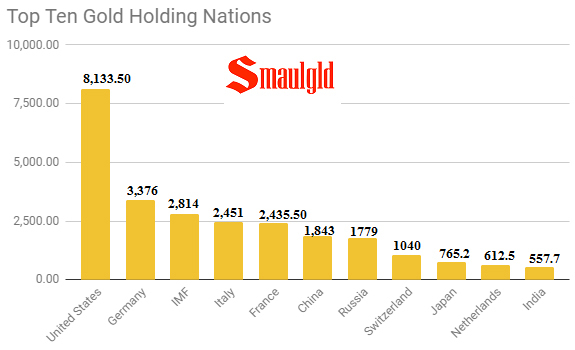 Why are these countries accumulating gold? More on that in a moment. 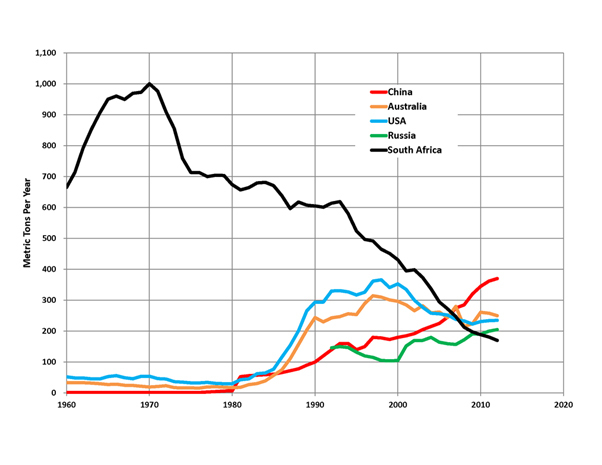 Meanwhile, the geopolitics of gold mining is changing too. The former powerhouse of South Africa has fallen badly. China is now the major producer of gold. The reason gold is so high on the agenda of geopolitics is historical. The experiment of fiat money is still fairly new. The US dollar went off the gold standard in the 70s, ushering in an era of terrible inflation. Today, the position of the US dollar as the world’s reserve currency is perceived as an unfair advantage by some nations. But if they want to turn away from the US dollar, where do they turn to? Some nations are already using gold as the alternative. Iran, Russia and China, suffering under economic sanctions, use gold instead of US dollars in international trade. Perhaps gold is set for a return to the world monetary stage? The most imminent threat to your gold investment comes from the questionable nature of the gold market. There is a long list of players who abuse the weaknesses in how gold is traded. As described above, the gold price is financialised. It can easily be manipulated by people with no connection or interest in physical gold. Or by those with the wrong sort of interest. It’s not just about traders looking to make a quick profit by manipulating the market. The gold price is a measure of geopolitical tension. Governments wanting to hide their mismanagement of the economy like a lower gold price per gram. A high price is an embarrassment because it signals scepticism of their plans. Central bankers are sellers and buyers of gold. The gold price determines the return they get, or the cost of their purchases. Former Chancellor of the Exchequer Gordon Brown famously sold a great deal of Britain’s gold at the low point off the gold price – a period now known as the Brown Bottom in honour of his mistake. Thanks to all the controversy surrounding gold in financial markets, it’s best to own at least some of your gold outside the financial system. Many people are intimidated by the idea of buying physical gold as an investment. But it isn’t any different to buying jewellery or diamonds. You simply go to a shop and purchase it. Just like jewellery, there are more reputable sellers, cheaper ones and more convenient ones. All you have to do is make a quick comparison so your purchase is informed. Gold is a small, but crucial part of the portfolio of the modern day investor. It always has been. But the financial industry has slowly tried to sway the British public against the precious metal. Because of gold’s properties as an investment, owning it in its physical form is a key part of the premise. It’s a real, tangible asset you can touch, hold and keep secret. Investing in paper gold – ETFs or gold stocks – can be an excellent idea too. But missing out on the security of physical gold negates one of the metal’s key benefits. You still rely on a counterparty if you invest in paper gold, while the physical doesn’t require anyone to fulfil any obligations to you to realise its value. The key question is how you should own the yellow metal. If you’ve decided to invest in physical gold, you have a further decision to make. You’ve got to decide which form you’d like it to take. Bullion: gold bullion is the cheapest way to purchase the physical metal. Bullion is essentially gold in its simplest form. It comes in ‘bars’ of a wide variety of sizes. Some are cast, which means they are poured into an ingot mould. The rest are minted, meaning they are cut into shape from a piece of gold. Assuming you are comfortable with the idea of keeping gold bars in your home, there needn’t be any ongoing costs from owning bullion. Coins: these are a little more aesthetically pleasing than bullion. But please note that some coins — known as numismatics — are not valued for their gold content, but for other attributes (like their rarity or their physical condition). It is debatable whether you are investing in gold when you buy a gold coin because it is rare or some other such feature. The mark up can be so high that the gold content is not the relevant part of the investment. So please make sure you are aware of whether the coin you are buying is valued at the gold price, or the gold price plus some, often exorbitant, margin. Gold bars and bullion type coins are called bullion and their value is based purely on how much gold they represent by weight and purity. Although a particularly reputable maker of bullion might command a slightly higher price, that’s because people feel more sure about the purity and weight. Gold purity is usually measured in carats, sometimes spelled karats. The carat scale goes from 24ct, over 99.95% pure gold, all the way down to 9ct, under 40% purity. Copper and other metals are typically added when manufacturing jewellery, as gold by itself is too soft. Fineness is a more strict way of measuring gold purity. This scales from 999.999% – referred as six nines fine – to 24 carat gold at 999, or three nines fine. Semi-numismatic coins are valuable for more than just their gold content. They might be rare or have collectors value, as well as historical significance. But in the end, semi-numismatics are still about their gold content. They trade at a premium above the gold price which can fluctuate, but tends to stay stable over time. Numismatics are valued far above their gold content. They’re very rare, have a famous origin or a historically important. These are not really suitable for investors looking for exposure to gold itself. Unless, of course, you manage to find them for bullion prices. Investing in gold bullion can have impressive tax benefits. When you buy gold bullion, you are exempt from value-added tax (VAT) and some coins are even exempt from capital gains tax (CGT) because they’re classified as legal tender – money. VAT can be charged on gold coins if you buy them as a collector instead of as an investor. The government classifies this based on the premium paid above the gold value. If you pay more than 180% of the gold value of the coin, you’ll have to pay VAT too. Silver is not exempt from VAT. There’s a particular place I think you should start your physical gold ownership journey: Investing in gold coins. The British gold sovereign is the original one pound coin. That means its exempt from CGT alongside a few other precious metal coins. Most sovereigns are considered semi-numismatics, so they trade above the gold value. But that premium is fairly stable and an opportunity for a shrewd buyer. The Coin Act of 1816 specified the sovereign’s characteristics. The one pound sovereign must weigh 0.257 ounces or just under eight grams and be 22 carat gold. There’s a big market in buying and selling sovereigns, not just in Britain, so you don’t have to worry about buying and selling convenience. Any gold dealer will have them. It’s best to go to a large reputable one to ensure you’re not paying any excessive premium. Don’t forget to check online prices while you’re buying so you have a good comparison. Always be willing to walk away. Go ahead and buy one gold bar. See how it makes you feel. If it helps your wealth feel more robust, go ahead and invest a more substantial sum. If you enjoy semi-numismatics like the Sovereign, there are many very similar options from countries around the world. The Canadian Maple Leaf, South African Krugerrand, American Eagle and Australian Kangaroo are great options. But buying pure bullion bars is the most basic way of investing in the gold price. You pay the lowest premiums. Each different maker has their own. Counterparty risk: Perhaps the most important attribute of gold is that it carries no counterparty risk. You are not dependent on any other person or entity when you own gold. There is no stock broker or bank that can go broke, there is no government institution where you must register your title to prove your ownership, gold isn’t a share in company that can fail, there is no way the gold can be copied or resold and there is no exchange or clearing house that can close its doors on you. All this minimises the kind of risks that are important during a crisis. But some ways of investing in gold relinquish the crucial advantage of not having counterparty risk. For example, some investors in gold discovered MF Global had tricked them out of their investments when the brokerage went bust in 2011. Costs: This factor is very simple, but worth spending time on. And the big lesson is do the math!Make a table of costs for each way of purchasing gold you are considering, just like the one above, to work out just how much you are paying. Size matters: A large purchase, both in terms of the size of the gold bar or coin and the size of the dollar purchase in total, can reduce the cost significantly. Once again, do the math on all your options. It pays to be a little flexible too. Storage: Keep in mind the purpose of your gold. It’s no good depositing it in a bank if you’re worried about a financial crisis. Most people looking to ‘take delivery’ of their gold are the kind who don’t trust the financial system. So stick with non financial institutions if you wish to keep your gold secure. There are plenty of vault and storage options around Britain, but it’s best to choose one near you. If you choose to keep your gold at home in a safe or other safe place, don’t talk about it. Not to anyone. That can be difficult for a passionate gold investor, but it can end up being the source of plenty of sleepless nights if people know where your gold is kept. There are many websites dedicated to hiding gold in your home. One surprising suggestion is to paint a gold bar black and use it as a door stop. That sort of simple trick might be a terrible idea for one person, but a suitable solution for another. Fraud and scams: The world of gold features plenty of unsavoury people, businesses and practices. It is crucially important to seek out the most reputable institutions, selling the most reputable version of whichever type of gold investment you decide on, and then remain as suspicious as ever. 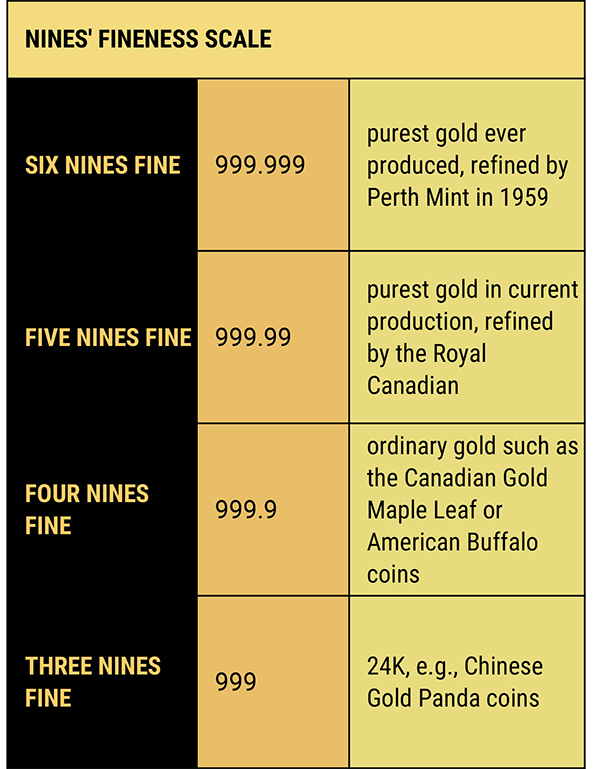 Size of your purchase: Gold bullion dealers are required to record your identity if you purchase more than $5000 worth of gold in a week. Regular cash purchases of less than $5000 would leave no paper trail. That means nobody would know how much gold you own, or what price you paid for it. One of the best ways to invest in gold in the UK is to buy Gold Britannias and or Gold Sovereigns from GoldCore who provide insured delivery services and Secure Storage in ultra secure vaults internationally including Zurich and London. Gold Britannias (1 oz) and Sovereigns (0.2354 oz) are capital gains tax (CGT) free as they are legal tender sterling coins. Premiums on these investment grade bullion coins have come right down and there is a considerable saving on the total investment cost because of the CGT exemption. All other gold investments, including gold ETFs, digital gold vaults, gold mining shares and funds attract CGT. CGT currently stands at 20% for higher rate taxpayers and 10% for lower. Given the indebted position of the UK government and the risk of a Labour government, CGT will likely go higher in the coming years. With gold prices likely to surge in the coming years, the CGT liability could be very high. Okay, that’s just a brief introduction into the role, purpose and ‘meaning’ of gold. There’s a lot more to talk about and understand regarding what’s happening with gold and the changes in the world that could have a shocking impact on the price of gold in 2019 and beyond. I hope you’re as excited as I am to dive further into this fascinating world. More again very soon in the run up to The 2019 Gold Summit.